Fringe: The Return of David Robert Jones? Sometimes Peter Bishop not existing isn’t such a bad thing. Take, for instance, the story possibilities that could arise now that Peter Bishop (Joshua Jackson) never existed. Imagine the impossibilities, Fringe‘s tagline declares. While mulling over what could happen next in the story, my thoughts stumbled upon my favorite impossibility thus far: the return of David Robert Jones. 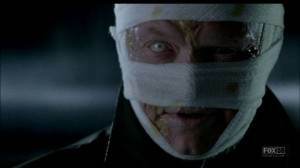 Jared Harris’s villainous David Robert Jones was perhaps the highlight of the first season; this was before the really meaty main cast parts started coming along in season two. No, Jones was the perfect bad guy for the first season of the show, back when we were just starting to understand the concept of alternate universes. Unfortunately, he found himself literally trapped between the two universes in the season one finale, and was chopped in half when a certain someone forced the universe portal to suddenly close. Have a guess as to who that someone is. However, now that Peter Bishop never existed, does this mean we might see Jones again? The cards all seem to be lining up right; Harris’s other gig Mad Men has been postponed enough to potentially allow the actor to fly up to Vancouver to film. If there’s any character at all I’d like to see return to the show, it’s Jones without a doubt. Not because he’s named after David Bowie or because he’s played by the absolutely magnetic Jared Harris, but because he introduced us to so much. He was the first one we saw to create a portal between the universes. He introduced Olivia to her dormant psychic abilities. Hell, he was the first recurring antagonist the show ever had! And there were just so many more questions left about him that it’d be a shame if they didn’t bring him back in some capacity (also notable: as far as we know, the David Jones on the other side is still alive). At the very least, bringing Jones back would give Peter’s sudden disappearance a bit of a silver lining. Fringe will return for a fourth season in the fall.